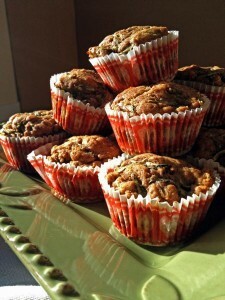 Time for some tasty whole wheat zucchini muffins! I love zucchini breads and muffins and this recipe is a winner, from 100 Days of Real Food. This is a great blog with all sorts of information and ideas for cutting processed foods out of your diet. Now, onward to the making! If you’re short on time, you can grate the zucchini a day or two before and refrigerate it so everything is ready to go. Yellow squash would work well too, either in addition or in place of the zucchini, and next time I may add a handful of grated carrots for extra veggie goodness. I used coconut oil instead of my usual olive oil or applesauce. Did you know Costco sells this now? I have also found it for a reasonable price at a local middle-eastern market, so if you don’t want to pay the regular grocery store price keep an eye out, there are other options. As always, look for ingredients at ethnic-focused stores, you might be amazed at how much money you can save, and a lot of these are small family owned places who I love to support. Local kudos go to the Wasatch Front Farmers Market for mountains of zucchini, Clifford Farm for the wildflower honey and fresh eggs, and Spoons ‘n Spice Kitchenware for the beautiful plate/tray. Add the eggs, oil, honey and vanilla. Stir just until mixed – do not overmix. Fold in the grated zucchini and nuts or raisins. Pour batter into prepared loaf pan or muffin tin and bake until a toothpick comes clean in the top/center. This is a thick heavy batter and it doesn't rise much in the muffin shape so go ahead and fill those babies! Bake: For a loaf pan bake for 50 – 60 minutes. For muffins bake for 15 – 20 minutes. Serve warm with butter, cold for breakfast, or in lunch bags for afternoon pick-me-ups. Enjoy and don’t forget to freeze the leftovers! This entry was posted in Breads, Brunch and tagged dairy-free, diabetic-friendly, preserving the harvest, summer, vegetarian, zucchini. New Location: Fort Wayne, Indiana!